THE STORY - Journalist Eddie Brock is trying to take down Carlton Drake, the notorious and brilliant founder of the Life Foundation. While investigating one of Drake's experiments, Eddie's body merges with the alien Venom -- leaving him with superhuman strength and power. Twisted, dark and fueled by rage, Venom tries to control the new and dangerous abilities that Eddie finds so intoxicating. THE GOOD - A nonsensical romp for those who are willing to look past the films very obvious flaws. ​​​​​Superhero movies used to be a rare treat, but now superhero film fatigue is a common idea that effects every new addition to the genre that is released these days. With the recent confirmation that almost all of Marvel’s intellectual property is moving to Disney, “Venom” was caught in the crossfire of the dust settling between them and Sony. 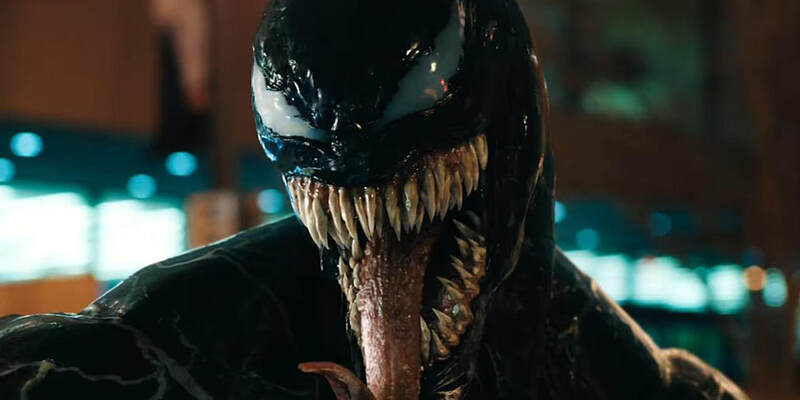 Venom is a character more suited to Deadpool style treatment than a typical X-Men or Spiderman character due to their violent and naughty content. Sony chose to play the safe route with “Venom” and opted for the PG-13 edit that unfortunately includes some obvious cuts and a significant lack of blood or gore. Despite all these factors, “Venom” can be a fun watch as long as you set your expectations appropriately. In a familiar establishing scene, “Venom” opens by showing a spaceships trouble descent through Earth’s atmosphere. Once it crashes we quickly discover that the ship is carrying 4 creatures from outer space that the scientific crew has dubbed symbiotes and one has escaped into the wilderness. From there we move to the San Francisco, where successful investigative journalist Eddie Brock (Tom Hardy) lives with his fiancé Anne Weying (Michelle Williams), a prominent lawyer. Despite being known for his hard-hitting style, Eddie’s boss asks him to give a puff interview to a tech giant, Carlton Drake (Riz Ahmed). When Eddie runs across confidential documents about Drake on Annie’s computer he can’t help but confront the man about his dirty laundry during the interview and ends up losing both his job and his relationship during the fallout. When a scientist from Drake’s lab comes to Eddie with proof that they are performing deadly experiments on human subjects, he follows her to the lab and ends up infected with the symbiote Venom. Soon enough he finds himself running from the security forces of Carlton Drake at the same time as he is dealing with the strange new entity that is now living in his head. As he adapts to his new situation and discovers the truth about the symbiotes purpose in coming to Earth, Eddie Brock finds himself forced to choose between running from his problems and working with this new entity in fighting to save everything that he holds dear. All too often “Venom” feels like a flashback to a previous era of superhero film. It’s almost immediately apparent from its cartoonish CGI and willingness to embrace the more absurd aspects of its main character that “Venom” is aware of the type of movie that it is, and it isn’t afraid to lean into that stereotype. The predictable plot line and boring dialogue do almost nothing to help the film along and for the most part, the burden rests on the shoulders of the performers to keep the story running smoothly. Thankfully the cast can give this film the life it needs to stay afloat and particularly Tom Hardy’s willingness to engage in the role with the same fervor that he does any other performance is what saves this film from being a total flop. Hardy plays the role of Eddie Brock, a man who is desperately trying to come to terms with himself who also happens to have an alien symbiote in his body, with a sincerity that elevates the film from being a silly over-the-top superhero film to having a little more depth. His efforts give “Venom” a serious anchor for its outlandish story that it so desperately needs to keep it from feeling like a total farce. Meanwhile, Riz Ahmed thoroughly embraces his role as a supervillain and his wild-eyed ranting and ostentatious scenery chewing serve to heighten the comedy of the film. Michelle Williams is given the role of the fixer as Brock’s ex-girlfriend and isn’t given much of an opportunity to do anything but caretake for him in this film, but during those rare moments that she is released from this constricting role, she only leaves us wanting more. On the whole, with its dull script that makes poor use of an interesting character, “Venom” is not a very good film. It’s painfully predictable plot drags about 20 minutes too long and its biggest action scenes are too choppy and blurry to make a real impression. But even with all of its flaws, or perhaps because of them, “Venom” is still fun to watch. Hardy’s willingness to indulge in the lesser points of his character, and the filmmakers' commitment to producing a mediocre product, make for a clashing tone and feel that hits the sweet spot of a bad movie that still manages to entertain its audience. While “Venom” may not be what the studio hoped for, it’s still a pretty fun experience for those who are willing to overlook its obvious failings to find the charm beneath the surface.